A major festival for the Chinese people, the Dragon Boat Festival is observed every year in China and also in many other parts of East Asia as well as in some regions of the West. Though a lesser known occasion, owing to low publicity and little commercial interest, the festival has slowly been acknowledged and got much ground in recent years. Know all about the splendid Dragon Boat Festival and its significance for the Chinese people. If you like reading about the Dragon Boat Festival, which we're sure you will, click here and pass on this page to your friends and dear ones. Have pleasure with TheHolidaySpot. The Dragon Boat Festival is a traditional Chinese festival held on the fifth day of the fifth month of the Chinese lunar calendar (varying from late May to June on the modern Gregorian calendar). Commonly known as “Duan Wu” in Chinese, this unique occasion is grandly celebrated everywhere in China and also observed in various other parts of East Asia as "Double Fifth Day". In the West, it is popularly known as “Dragon Boat Festival” and is typically celebrated during the summer months with dragon boat races and competitions being the focus of the activities. The Dragon Boat race is the most important custom of "Duan Wu" and an inseparable part of the festival. The boat racing used to be an ancient outdoor sport in China where dragon-shaped boats took part in the races, symbolizing a real dragon fight in the heavens, to bring heavy rains. The festival was held after the spring planting, when people had time to relax and needed rain for their crops. The tradition continues to this day with an annual regatta being organized that sees the participation of long, narrow boats shaped and painted like dragons. Competing teams row their boats forward to a drumbeat racing to reach the finishing line first. The 5th day of the 5th month of the lunar year is an important day for the Chinese people. This is around the period of Summer Solstice, believed to be that time of the year when the sun and the dragon are at their most potent phase. Hence, the “Duan Wu” is held during this time with the observance of ritual celebrations such as dragon boat racing. It is also the time of farming year when rice seedlings must be transplanted in their paddy fields, for wet rice cultivation to take place. In modern era, the Dragon Boat Festival is celebrated wherever there is a presence of the Chinese community. 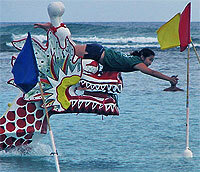 The Dragon Boat Racing has evolved into a popular international sport. In Singapore, the festival is a noted tourist event and competitors from Asia as also of other parts of the world enter the annual race. Fundraising and community work are also associated to this wonderful event.